This place is a hit or miss. Yes they have a bunch of stuff in stock but they’re not very busy either, not as busy as Gordon’s. Location is possibly a reason. One is on main street, downtown, and this one is a bit out of the way and near the exit of a freeway, but going the wrong way. That said, I’ve been here a few times. Once I think I met the owner who was super nice and said “It’s hard to find good workers.” when I mentioned my previous visit that left me less than satisfied. Because of him I gave this place another go. Each time, it has been different. Sometimes people know what they’re doing and sometimes it’s like they hired someone from Walmart who barely knows what a note is…or they don’t care. What’s taken the cake is I’ve ordered a couple of Ukes and it’s like they were forgotten orders. The first time I ordered, back in January, no one ever called. The second time I ordered, the owner called me a week after I had gone in and got a horrible experience and I think it was because of that, not because my Uke came in. Outside of the one time, I’ve never seen the owners there, just young people staff. I think they need to be at their store more often if they care about their business. That’s one thing about Gordon’s. Outside of a Sunday, every time I’ve gone there, Mr. Gordon is at the store. Whether he’s a workaholic or likes to keep his staff in line, I don’t know, but if there’s a problem he’s there to fix it straight away. I am not saying I’m never going to Live Music but there have been more bad experiences than good ones so I’ll probably go there for supplies. But when it comes to ordering instruments, I’m going to Gordon’s. They actually call you back when your instrument comes in, instead of putting it out on the floor to get sold first. Rolling around in the insane heat, I needed a drink. Noooo… not that kind of drink, something icy. Starbucks caught my eye so there I went. 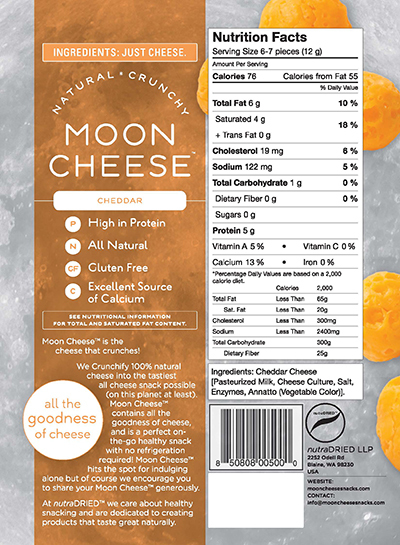 The line was a bit long and in the “aisle” was this… Moon Cheese. What on earth? I flipped it over. Huh… Just cheddar… Crunchy cheddar? Um… what..? OK… Soooo I bought it. Why not? It couldn’t be that bad, right? I love cheddar. The nuggets look just like the package. When does THAT happen?! I can’t remember the last time a food looks like what it is. This is a good sign. I take a bite and hmm… no taste…weird… I’m so used to Cheetohs and their explosion of flavour. Well, shoot…what’s going on? Crunch… Oh! Cheese! Crunch, crunch, crunch… Yes! I taste the cheese…a slightly sharp cheddar. Wow! It’s like having curds but crunchy curds. I really like this! Whoever made these things is a genius. It says gluten free but I’m not sure if there was ever gluten in cheese… IN any case there, there is that. Also it’s healthier than Cheetohs and that’s gotta count for something, right? I mean, I can actually pronounce the ingredients in this. If you love cheese, I’m pretty sure you’ll like this if you don’t love it. Yes, it’s not the ooey gooey cheesy goodness of like pizza cheese but it’s still pretty dang tasty AND it doesn’t go bad in the heat. All in all I love moon cheese! I don’t love the price, $5 for 2 oz. but once in a while, I’ll definitely enjoy this treat. Looking online there seems to be pepper jack and gouda flavours too but I don’t eat either of those cheeses but if you do, give them a go, I bet you won’t be disappointed. I also saw online that you can make them into croutons…if I ever eat salad I might try it…who knows. No I didn’t get paid for this review. I had actually never heard of this ’til today. I’m glad I found them! McDonald’s has new Big Macs?! It’s been a couple of weeks now but we went to McDonalds for a Caramel Frappe, which if you read my previous blog article is my new favourite starbucks. 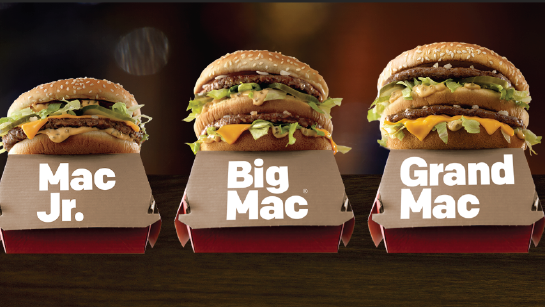 They asked if we were interested in a Mac Jr or Grand Mac.. we’re like huh, what? No… just the drinks. Well today I decided to try the Jr because I’m not sure I can eat the Grand Mac when the Big Mac leaves me pretty dang full! And you know what? The Jr is the perfect size! Whenever I go to Burger King, unless I’m completely famished, I get the Jr there and I’m totally fine. But at McD’s I’d get their cheeseburgers which are good but you need two to fill up. I usually get the kids meal because of the fun toy and well, enough other stuff to fill me up. But now with the Jr, I don’t need to do that anymore. So before I ordered I asked what the difference is with the Jr. and they said the meat is different, it’s a little smaller than the quarter pounder (they aren’t kidding) but the rest is the same, pickle, lettuce, and mac sauce. I was like OK and said I’ll try it. I’m expecting a glorified overpriced cheeseburger but I was wrong. I rotated it and the meat is as big as the bun! When was the last time that happened at McD’s?! Well OK, I don’t eat the quarter pounders so maybe they’re that big too, I don’t know but I can tell you that the normal Big Mac patties are NOT this size. They’re skinnier and smaller. So I’m thinking you get the same amount of meat and one less bun which is fine with me because saves calories and carbs! I am pleasantly surprised with this Jr.
I’m thinking McD’s better start paying me for all this endorsement! But this was a quinky dink. They’re not Habit Burgers, which I still have to do that review but if you want fast food that fills you up and you have, I guess, a small stomach, this will do just nicely. Til next time, thank you for reading and spring is almost here! Does anyone really get that gardening joke? haha. As usual, if you’d like to donate to my cause for a laptop click here. If not, that’s cool too. I love to write either way. I went and got a caramel frappucino the other day and I was disappointed. Normally they kind of look like this. And this one did, more or less. 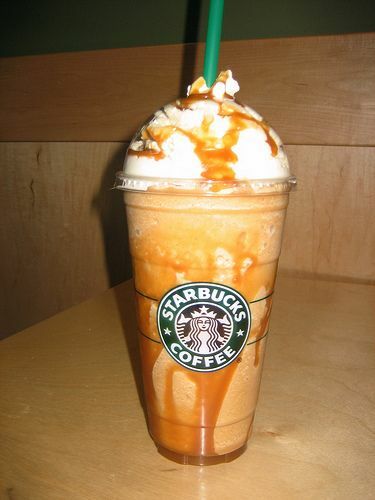 Yes, I like extra caramel. 3 different starbucks, 3 different cities, same damn drink! OK what gives? Was I too distracted to notice no one wants coffee in their fraps anymore? Well, at least they still have macchiatos but it just isn’t the same… I like they coffee slushy… Picture me with a total sad face. Then, my husband goes to fast food and brings me a rescue drink! Now see, we all know that McDonalds has cheaper coffee but is it better? This was their caramel frappe, with an e to make it fancy! OK McD’s what are you trying to pull? Goodness… what’s this…? Coffee?! There’s actual coffee flavour slushy…!? Oh my wow! This was sweet and coffee and slush… JUST like the fraps used to be! But well, not as much caramel… until of course, I said the magic words…”extra caramel please.” and voila! Holy ginger snaps! All the gooey caramel and the coffee slush?! Hooo yeah, come to me baby! Star who?! I was back in my coffee caramel slush heaven. But there’s a price to pay, of course. For one, your version of extra caramel may not be that of the person making it. 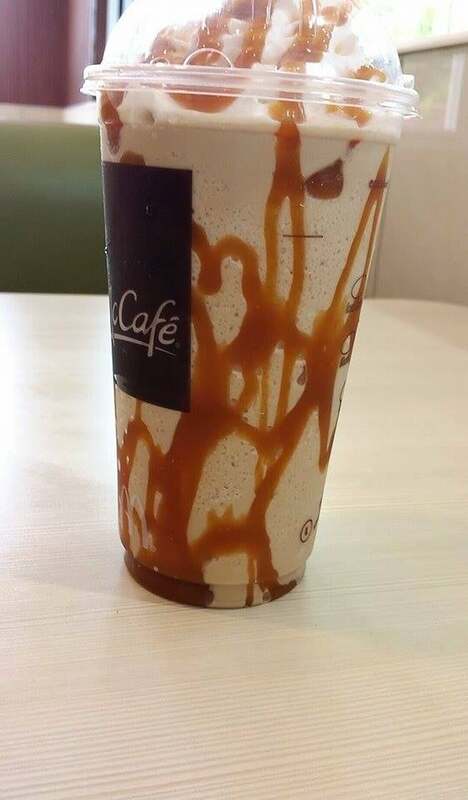 Unlike Starbucks, the McD team takes caramel liberal. Their drinks can vary depending on who makes it. However, if you’re in it for the coffee more than the caramel, you’re golden! Oh and you have to pay extra for the extra caramel whereas as Starbucks just does it… I think… I haven’t had one in a while but last I heard it was still free to ask for extra drizzle. Oh and you can’t get extra shots with McDonald’s because theirs is a premix, which I guess so is Starbucks but they can still add an espresso shot or whatever where as McD’s can’t… at least I don’t think so…never asked but I don’t think they sell espresso. So now that I’m getting fancy and branching out… why did I never go to Peet’s?! I decided to try the burger king version of this drink. And their premix is similar to McD’s but maybe more creamy, though not as bad as Starbucks, and sweeter. It STILL has coffee flavour though so it’s not watered down. The caramel is alright as well. Oh right… I remember why I didn’t try another coffee shop… both the McD’s and the Burger King option are cheaper! Well… Maybe one day I will try another coffee shop’s version but isn’t that like going to Teavana and expecting cheap Tea? I think I’m better off with the fast foods for now… or if I can find a local coffee shop…maybe there. I think the commercialization of Starbucks and their stretched thin because they’re on every corner made their fraps fall flat which is sad but ey, more money in my pocket! Have you found a good frap somewhere else? Let me know in the comments below! I know it’s been forever since I’ve done this. Something called a job has been keeping me distracted…one day I’ll have to get rid of that to focus just on this…but until then I’ll just have to keep trying harder. I have so many reviews backed up! And of course, kitten stories! Until next time, folks. Thank you for reading! Life sure is funny… Child Support intricacies. Yup, life is definitely funny… Today I had to work on a case about a man who ran off to El Salvador instead of paying child support. It’s a bit ironic since I was just talking to my brother about my donor who kinda did the same thing. Of course, he was told that no, the donor paid child support and never skipped out. I’m sure my brother got the lines fed to him and as a child, how would he know any better? Who wants to think of their dad as a deadbeat? I get it because it’s not a good word but how else do you describe someone who ran off and never looked back? As a grown up, how can you see facts and still deny them? My brother said, of course dad (his dad, not mine) paid, otherwise he’d be in jail! Clearly that never happened so he must have paid, right?! Well no. The man ran off to another country. We have no jurisdiction there for one and for two while some deadbeats DO go to jail, the majority get away with murder, in a sense. Why? Because we rather give them the chance than throw them in jail where they have no chance. But don’t run our patience to the ground. There ARE those that go to jail. The donor was lucky he didn’t get arrested on the spot when he came back into the country. He’s very lucky that a lot of things that should have happened, didn’t. But if he were a man he’d step up and say yeah, I screwed up but I’m here to own up to my responsibilities. Here’s copies of the payments I made. I have deadbeats who turned human in my office. People who stopped running and owned up to their mistakes. Some just want to start over and I love helping those people. See, to me, you’re not a deadbeat if you’re trying. But if you don’t even try, what am I supposed to do with you? If you’re constantly running, what am I supposed to do with that? Now see, back to the money issue. The donor claims he has paid child support for all those years. I don’t know how many but it probably wasn’t for 10+ years. I know of two month’s worth, nothing more. The sad thing is, it was only $50 a month for TWO children. See, he was hiding back then too. He had income but he told the judge he had none so he got set at a very low amount. That much is also on record, that he told the judge he had no income but considering he was the only one working and couldn’t get on social services, he HAD income because they weren’t homeless. He had an Audi which isn’t a cheap car, gas for said car, an apartment and presumably food on the table for him, his wife, and my brother. How can a man afford such things without an income? I guess it’s magic. Growing up we didn’t have a lot of money so I doubt that $50 ever came in but who knows, maybe it did but somehow it magically came from El Salvador too I guess because he ran off and remained for many years. No contact, no hey are you OK? Nothing. But of course, he says that was my other donor’s doing. She didn’t let him see us. Right… except when we turned 18 what was your excuse then? See, the man has a lot of excuses and very poor action so forgive me if I don’t give him the benefit of the doubt too often. I tried. For MANY years I tried and all I got were a bunch of excuses with nothing to back things up. Now the donor’s back in the country and well, I’m sure his debt is quite high but of course he can’t “pay” now he’s old and decrepit and blah blah blah. I hear the stories every day. It’s fine. Karma or God or whoever will take care of that guy, same as the other guy who ran off to El Salvador. I seriously doubt he will step up to the plate now. I seriously doubt he even cares to make things right. He’s too caught up in people feeling sorry for him that he can just skirt by and people forgive him because he’s sick or feeble or whatever. My life was harsh, very harsh, growing up so I have no sympathy for him. I don’t swallow his lies nor do I care that he’s supposedly sick. He’s not sick enough to travel all over, is he? He wasn’t sick enough to work in El Salvador was he? But to pay child support? No, no, much too sick for that. Yeah OK, sure. Super long story short? A man who skips out on responsibility is NOT a man and never a father. Doesn’t matter if he was a “good” father to the other children. When your first born children become third class citizens, you’re not a father. You’re a SAD excuse for a man. I cannot and will not respect that. I have enough BS at work to even start with that. But it’s ironic, like I said, that I work where I work and in the department that I work. I didn’t pick it. Life just sent me that way for a reason. Perhaps to dig up the truth or to find out that not all guys are bad. To see both sides of a very convoluted and often sad sides of the coin where children are the ones who suffer because people just can’t get along. I can understand hating your ex or at least strongly disliking them but don’t let the children pay the price because you chose the wrong person! And that’s often what happens. Children are the ones who pay the price for the stupid decisions so called grown ups make. But all isn’t lost. I do see the good ones and the ones who are trying. They collect cans and do whatever jobs to pay their support, however little they can for THEIR children. They get up when they’re tired, keep going even though they can’t or shouldn’t, they do whatever they can. THOSE are the real men. THOSE are the fathers. But the fools who can’t even pay a dollar a month for their kids? Those are not even human. How can they eat something and not pay ONE DOLLAR to their kids? Ridiculous!! Oh yes, I have a bunch out there who’s support order is that little. Some are low enough that you can’t even buy a fast food meal with what they’re supposed to pay a month. But do they? Nope. There are some support orders which are crazy, in my opinion, but I don’t make the rules, judges and courts do. I just have to follow what they say. So if there’s a support order out there and it needs to change, I know it’s a hassle to do the court stuff, but help yourselves and get help if you need it. If your job is taking half your check and you’re still not paying the full support order, something is not right, you need help. If your employer is taking more than half, something’s really wrong! Call your agency to get that sorted. Now I know I’ve been talking about men but I want to note that it isn’t just men who are deadbeats. I have women deadbeats too. Women who dump their kids on aging grandmothers and grandfathers. Women who get knocked up and add to the burden. Women who went to get something from somewhere and never came back. As a mother I can’t even comprehend the level of, whatever it is, that’s going on. You had LIFE inside you. You felt the kicks and wiggles. But you just walked away? I know parenting is hard. I was a single parent myself but to just walk away? Makes no sense! What makes even WORSE sense is the women who’s men are TRYING desperately to connect with their children and the women say no you can’t because you don’t pay (enough) support, because you didn’t buy the right shoes, because you didn’t let the child eat (insert item.) So many children out there are struggling and these women have the golden tickets but they say no. It’s crazy! Again, I say, it’s the children who pay the price. Now I’m sure my donor will say that my other donor did this to him. But since the dude ran off to El Salvador and never looked back, well, that story just doesn’t fly, does it? Plus he had time to call me when my child was born, why didn’t he connect then? Instead he got himself back on the pity bus and ran off again. I tried to give him sooo many opportunities and well, my patience ran thin and now it’s gone. I don’t need anyone like that in my life. You go be the happy sack of whatever it is you are and leave me alone. I know enough now to kind of figure out who’s a deadbeat and who isn’t. And that was a hard lesson to learn too. You hear the word deadbeat and these poor guys, they get called that, even the ones that are trying and there’s such stigma! My job is to help those that are trying to figure something out. And I do help. I help those that reach out to me and ask for it. I sometimes call and they sound so ashamed but are hopeless. Some are so high in arrears that it makes my head spin and some feel they can never get out. But there is always hope and there are ways to help. Although some probably think they can’t because they keep making bad decisions with a lot of women. Same with the women who keep getting pregnant then dumping their kids or keep struggling with their kids, keep getting pregnant, and have several different fathers, sometimes as much as one kid, one father, 6 kids, 6 fathers, well you get the idea. I would think these people would learn and stop but well, that’s another blog post. 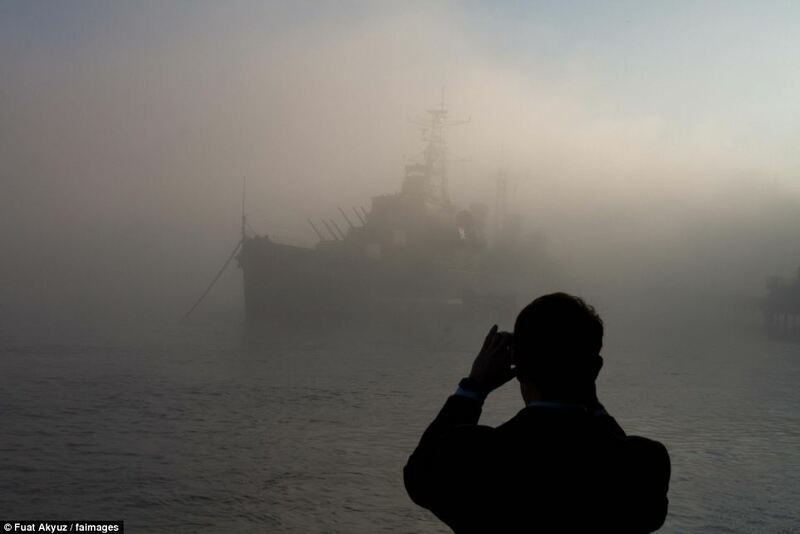 Who knows what’s going on there. Men and women both make bad decisions in my world. I think it’s always a good idea to ask and get the facts. Don’t run away, that just make things worse. 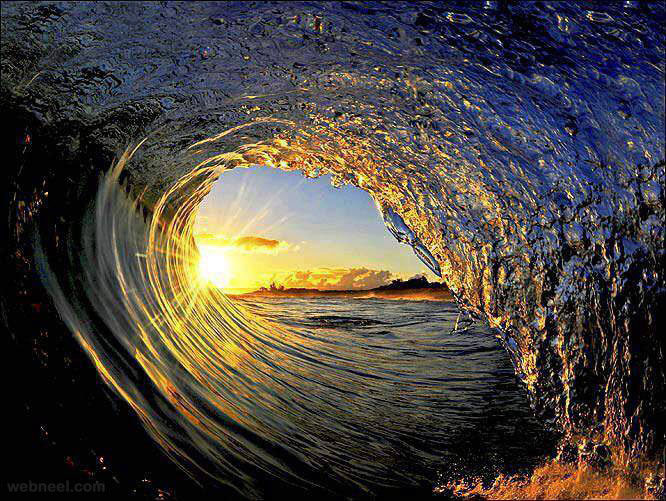 Don’t throw out your court papers or summons, that usually ends in disaster. And for goodness sakes, think of the children you helped come to this crazy world. Don’t make it worse for them because you and/or your ex are being idiots. If you messed up before that’s OK, it happens, but don’t keep running away from your responsibilities. One day, one of your kids might write a blog piece like this. What would like them to say about you? Wouldn’t it be better if they wrote, hey, at least they tried vs. nope, they were deadbeats through and through. My donor doesn’t seem to care. Don’t be one of those people. Be human and be a grown up. The truth is, I rather have had the time with the donor than the money. But I got a raw deal and so do other children out there. We are the voices that no one’s heard before. I hope I have given them a voice now. I’ll leave you with one last piece, one last story, if you will. I had a guy call me and saying he’s not a deadbeat but he thought our office thought of him that way because he couldn’t pay his full support. He took his child half of the week, every week, sometimes all week. I said to him, sir, you’re not a deadbeat. The fact that you take your child and that on top of that you try what you can to pay the support means you’re not a deadbeat. Let’s see what we can do to help with the support amount. I sent his case to be reviewed. His original court order said he did no visitation and clearly that wasn’t the case now. So you see? People do change. A man can go from deadbeat to human. It happens in our office and it happens everywhere. Men and women stand up for their kids. Be that guy or that girl. Make this nation of ours great by contributing to the upbringing of your kids. Those are the stories that keep me going. Those are the stories that make me think that the deadbeats can go human. Even my donor, if he tried. I think that ship is sailed but well, a girl can always have hope, right? One day after 40 years a deadbeat can go human. Hey, stranger things have happened, right? You just never know. And maybe someone out there will read this and turn human too. I can always hope, for the sake of the children, that it happens. I always keep that in mind. It’s about the children. Let me be their voice and help these grown ups come to an agreement so the children can be better off. I can’t do custody fights, that’s for the free family law facilitators, which I can send/give you information for but I can help when someone’s trying and struggling. Those are the ones that make my job easier and most prideful. I give my hats and my cheers to those people. They surely deserve it!